Disappointments: Permaculture is a system of design, which includes defining the area you live in by zones. Zone 0 is the home, and 1 the nearest to the house, which would include, for example, things needing to be monitored or watered often. This spring, I potted up some twisted willow cuttings, hoping to grow them into shrubs, thereby adding value, before we sell them. As they’ve become bigger, they need watering more but, as they haven’t been in view, they’ve been allowed to dry out a few too many times and have suffered as a result. Disappointed, I re-potted the worst affected and have moved them to where I’ll trip over them and have since been keeping them happily moist. Disaster struck again today, as we found a hoard of hungry caterpillars munching away on the few leaves left. We’ve yet to identify them, although Gabrielle has had great success previously using the ”What’s This Caterpillar” website, so we’ll keep trying; please post a reply if you know what they are. 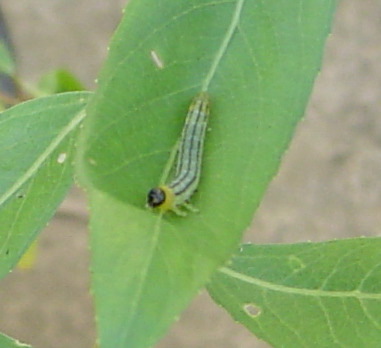 I’d placed them by a full-grown willow tree and, when I looked up, I could see the tree full of similar caterpillars. Whatever laid the eggs on the tree didn’t have far to go to find more vulnerable hosts. We picked off the caterpillars by hand (only a few plants) and fed them to our chicks and moved the plants again. In fact, it’s not a complete disaster at all and I have just got to be a little (a lot! – Gabrielle) less sensitive if not everything turns out exactly like it says in the books I’ve been reading. We have more to tell you about our cultivation of willow and construction of living willow fences (fedges) and structures, but today’s caterpillar incident has reminded me to phone our friends, for whom we erected 20 metres of fedge by their straw-bale house in the Lot this February but who also had a caterpillar problem last time we spoke.